Poi Meets Girl - by Tom Thordarson of THOR ART - There is a food native to Hawaii and the Pacific Islands known as "Poi" which is made from mashed taro roots. 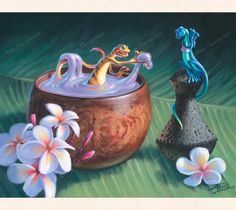 Home Pinterest Poi Meets Girl - by Tom Thordarson of THOR ART - There is a food native to Hawaii and the Pacific Islands known as "Poi" which is made from mashed taro roots. Poi Meets Girl - by Tom Thordarson of THOR ART - There is a food native to Hawaii and the Pacific Islands known as "Poi" which is made from mashed taro roots. It's a starchy, purplish paste eaten with other traditional foods of Hawaii, and always eaten with a finger as your "utensil." What a "romantic" gesture, I thought. if a gecko was trying to be a lil' gentleman, if he hopped into a fresh bowl of gooey Poi, got a big dollop on his finger and offered it with love to his gal sitting near by!